Gill Eatherley began her artistic career studying painting. She began making films in 1971 working at that time through the London Film Makers Cooperative. Eatherley's first two films, Chair Film and Deck, established her interest in exploring simple content and the medium of film itself. This apparently formal direction was always deceptive and masked the significance of the subject matter. Chair Film, later to be developed into an installation work takes as its subject a simple wooden Chair Filmed so as to be completely isolated from its background. If the sparse subject of the chair itself was what first motivated the filming it was the resulting image on the film, the effect of the negative image and a sequence of film slip - the unintended result of a camera fault - that ultimately became the main interest and content of the work. At this period, Eatherley's films evolved as screenings which particularly explored different projection formats. Chair Film became established as a four screen work shown in a simple rectangular format. The image of the chair, initially a single chair, but then two or three chairs printed through a blue filter, but always with no evident background, is occasionally interrupted by what seem to be drawn lines - arrows connecting or swirling around the chairs. 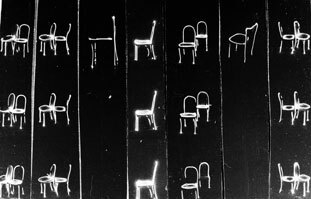 At one point in the film the photographed chairs themselves disappear and become instead just outline drawings in light prefiguring a technique later taken up by Eatherley in Hand Grenade. At another point the image of the chair in negative is extended vertically down the screen by the slipping image - then, it is moved, appears to hang and dance as an insubstantial ghost - an ectoplasm chair appearing, like those old fake photos, at a seance.